I finished both of these quilts for my identical twin granddaughters. They are different, but the same - just like identical twins! I can't wait to give them to them - or at least their mother. I can't actually expect them to love them - can I? Do three-year-olds have strong opinions about quilts? I kind of suspect they do. I will hold my breath - as I'm also sure that they don't say what they don't mean. IOW, if they don't like it, they'll say so! I'll probably let their mom give the quilts to her daughters. I'm practically a stranger to the girls. The fun thing about these quilts is that it was filled with novelty prints. I wanted to keep a lot of pink in it, though, since their mom told me that the girls love PINK! I hope their tastes don't change in the next couple of years. I made them big enough to keep them covered til they are quite a bit older than they are now. I used a variety of fun pink prints including some hat fabric, Russian stacking dolls, Hansel and Gretel, bandana, a school print, and that bright green one which had some glitter in it. My daughter told me that glitter doesn't belong in fabric - one time while she was working with some - but I think little girls will like it, don't you? The backing is paper dolls - an adorable print that I got from my sister. Since I have 2 granddaughters, and 2 grand nieces of my sister's that I'm in close contact with, I thought I could easily use up a whole bolt (15 yards). This did make a serious dent in it, but I still do have some left. I did simple loops quilting - just as I've been doing lately on any quilt that seems like it needs extra support. Plus it's easy, fast, and I like the look. I seem to have less puckering on the back with it, than with stippling and the overall effect is quite similar. 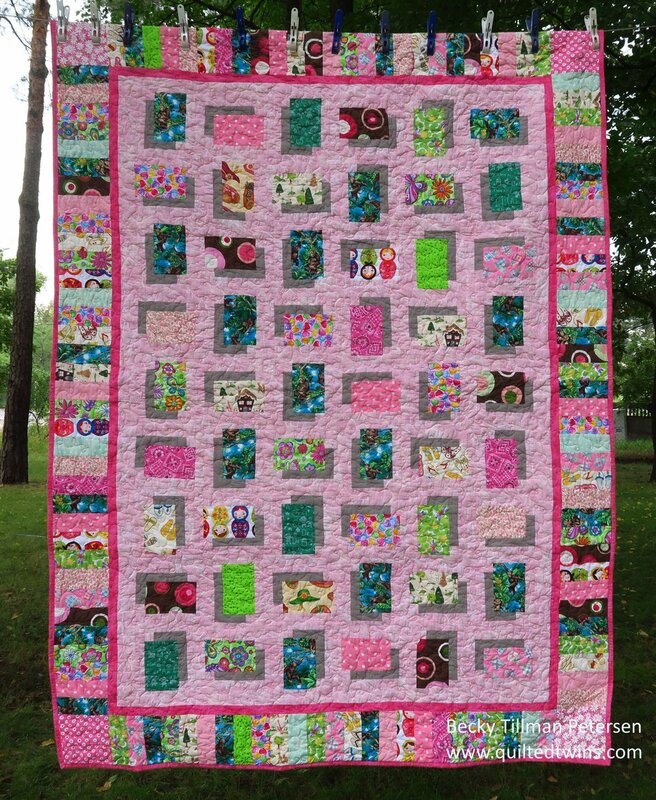 The monkey fabric is the "thing" that made me make these quilts this way. I had pieces of this fabric that started out only a bit wider than these - maybe 4.5" or so. I didn't have a ton of this fabric, so I didn't want to 'use it up' by making triangles out of it - I needed to be able to see as much of it as I possibly could. 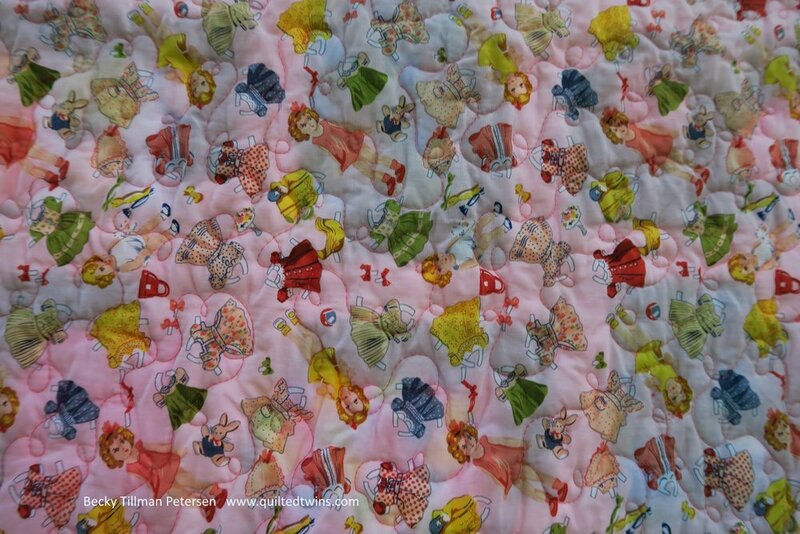 My son had told me the girls adore monkeys - that’s why I felt like I should put some in the quilts! That's why I decided on this shadow pattern. I had fun looking through my novelties for things that went with pink and my granddaughters. Of course, the Matryoshka dolls are adorable - but this print is large. I have no idea if they even know what they are but it's a nod to their father's upbringing here in Poland. We moved here when he was in first grade. Overall, these went together quickly. The hardest part of this was the actual layout of the pieces before I sewed them together. I tried to balance them and keep similar ones from being too close to each other, but I struggled. Finally I just stopped and sewed the top together! Quilting seemed like a piece of cake. Maybe it's time to expand my repertoire. I think all of these small ones seem really fast after doing 100" quilts so much of the time. 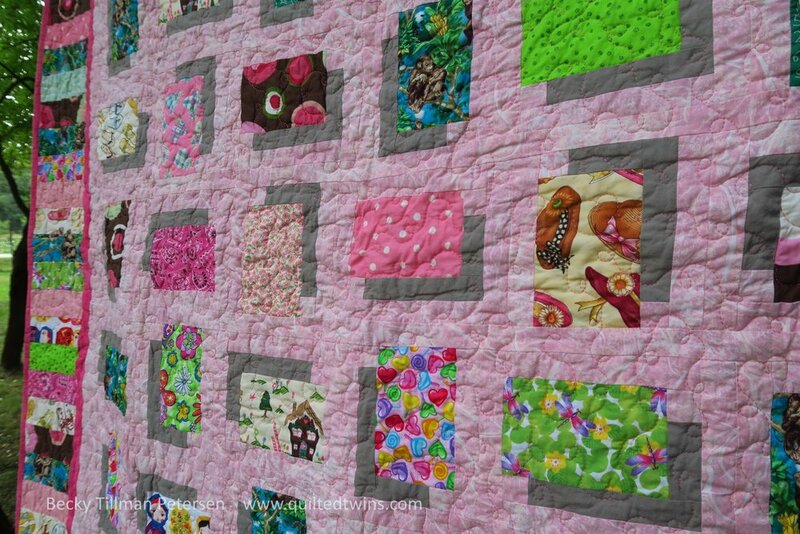 These are such "sweet" quilts. I really like them and I hope my granddaughters do as well. I did update the pattern and it's on the free patterns page. Be sure to check out what my sis has in the store! She works hard to keep you in fabric! Price is by the Yard. Colors may vary slightly from what is shown, but every attempt is made to be accurate, though screens do portray things differently. Quilter's Showcase Fabrics. Quilter’s Showcase is a fabric line carried and sold by JoAnn fabrics. Really cool creamy white background with blue rick rack. Becky's going to kill me! "A Hot Mess - Colorful"